Power-Dive, the debut by Cologne rockers Gun Barrel was one of the most unnecessary metal albums of the year 2001. Two years later, they release their second album called Battle-Tested, and it isn't better at all. As it had been the case on the predecessor, Gun Barrel play raw rock'n'roll inspired by AC/DC, Rose Tattoo and Motörhead combined with some theatrical elements reminding of early Kiss. 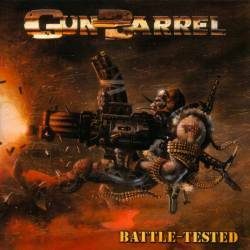 Even if all just named bands play on a very high level, the music provided by Gun Barrel is just ridiculous. Seldom before have I heard a German band with such a terribly sounding accent. Furthermore the songwriting is absolutely poor. The same can be said about the ridiculous lyrics who are supposed to be funny! No further chance for Gun Barrel in my CD player. There's nothing positive to discover on this album!